Are beauty products a major part of your life too? Then you are at the right place. Beauty products are actually the most important thing in a women’s life. Shopping for them is probably their favourite thing. Now, that they can shop it online, the sales of beauty products has increased even more. Sites like Nykaa have come up which sell amazing products on one single platform. Nykaa is probably the best site to shop for beauty products. Anything you need, from a lipstick to a makeup brush, you will get everything. You get the best prices as well. There is up-to 40% discount on major brands like Lakme etc. Most of the women daily think before applying the makeup because it may affect their sensitive skin. Worry no more! The best brand from U.S. is being launched exclusively on one of our favourite sites i.e. Nykaa. Smashbox is the best brand in U.S. and you get its exclusive products that have been made in the studios in L.A., only on Nykaa. Makeup is not just a luxury anymore, it has become a necessity. With the changing times, women have become more confident and want to look their best at all times. No one wants to compromise their perfect look. Everyone wants a smoky eye or the best contour. This has led to a significant increase in the number of makeup brands. The most important part of any makeup routine is a primer. Without the primer your makeup won’t be as perfect as you want it to be. It plays a really crucial role in defining your makeup look. This is why; you need to have the best primer in your makeup box. Smashbox has the best primer range at amazing price that you can easily avail to look ready for photo finish at all times. It is known worldwide especially for its primer range. This is because Smashbox Cosmetics are formulated without Parabens, Sodium Lauryl Sulfate, Phthalates, and Fragrance & Talc and are free from animal testing. The primer product like the photo finish foundation primer gives you a magical glow like no other product. The price is also very reasonable which is 3100/-. It is totally worth the good quality products they give you. Not just primers from the brand are good, the liquid lipsticks or chapsticks and even the colour palettes are very affordable and made with the best ingredients. Photo finish primer - radiant - Get the benefits of the primer, Hydration and sheer radiance in just 1 spritz! It has been designed specially made to wake up skin with electrolytes and restore moisture. The Primer Water absorbs into skin for lasting hydration. It is perfect for all skin types. It is available in a 30ml bottle and a 116ml bottle. The 30ml bottle can be bought for 950/- while the 116ml bottle is put up for 2900/-. The prices are very affordable as the primer is like a refreshing drink for skin. Photo finish primer- pore minimizing - This is an oil-free primer that mattifies and instantly blurs flaws, reduces the appearance of pores and controls oil for up to 8 hours. It dramatically reduces the look of pores by smoothening them & preps the skin for makeup. It doesn’t clog pores or cause breakouts, like other primers. You will love it because it has a smooth texture which gives an even finish. The price of the product is 1750/- in which you get 15ml of it. The product has been given 3 stars by the customers so it is very popular. Colour correcting foundation primer - This green-toned primer colour-corrects redness, blurs pores, evens skin tone & reduces the appearance of fine lines. It is available in apricot as well which is good for blending. It protects the skin from environmental damage, pollutants and stress with an antioxidant blend of peptides and vitamins A and E which is why it is ideal for all skin types. Just apply a layer to the face or problem areas only before you start your makeup and you will see the change. This change can be brought by buying a bottle of it for 2900/- only. Primer oil - This is ultra-light, fast-absorbing face oil that doubles as a primer to prep skin for flawless makeup application. It gives you a radiant, youthful look with a dewy finish. It even moisturizes the skin for seamless makeup. This oil has been blended with 15 lipid-rich plant extracts & essential oils including moisturizing jojoba and calming chamomile which strengthens the skin's barrier. It is one of the best dermatologist tested primer oil you can buy for 3200/-. Pricing - Buying cheap make up can be harmful for your skin because those products don’t have the essential things that are required to prevent the makeup from causing blemishes or breakouts. The makeup from smashbox has been made especially for people with sensitive skin. You won’t experience a single breakout after using the products. The primer range is so great that it doesn’t just act as a base for the rest of the makeup but it also acts a protective layer. You get all these on one platform and that too on discounts. 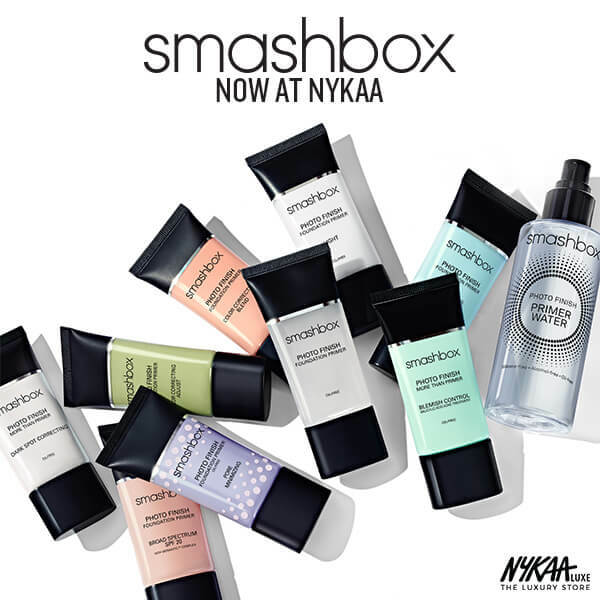 You can buy this Smashbox comestic products using Nykaa coupon code if you are feeling lazy to buy it on a shop nearby. The product range starts from around 950/-and goes up-to 3500/- and very few cost more than that. Packaging - We all experience major problems with the packaging of the makeup. The contour palettes and the foundation bottles are a true headache. Smashbox gives you its foundation range in tubes which help in easy applicability. The best part is that each and every product has been differentiated by a different colour packaging. Even if there are two types of products in a particular range, it has two colours which make the brand easy to recognise. Texture - The biggest problem that women experience with their makeup is that that the texture is so weird sometimes that the face doesn’t look natural at all. It clearly shows that some makeup has been applied to it and it doesn’t really blend properly. This is where the smashbox makeup ups its game. If you use the primer foundation of the brand, you will see that it is so smooth and you get such a beautiful natural looking skin after applying it. Ingredients - What makes a makeup behave in a particular way are its ingredients. If the ingredients are not right and full of chemicals then you will know right away because it will show up as breakouts on your face. This is why Smashbox Cosmetics are formulated without Parabens, Sodium Lauryl Sulfate, Phthalates, Fragrance & Talc and are free from animal testing. This is the reason smashbox as a makeup brand is so popular. Why Should You Shop From The Brand? If you want to buy good make up which is of the top quality, then Nykaa is your solution. It has huge brands like Lakme, Maybelline New York, L’Oreal Paris and the face shop etc. All these are counted as the sharks of the makeup and beauty industry. Adding on to this list, Nykaa is launching another brand Smashbox which is used by many makeup artists and models for big photo shoots. The range of all the products is so vast and exquisite that you can’t stop yourself from buying any of the products. Also, it is such a great opportunity that you can’t afford to miss.